Worn together or separately, a pearl jewellery set exudes class and sophistication. Our collection of sets includes necklaces, bracelets and earrings in a variety of pearl sizes, colours, and qualities. The Pearl Source offers pearl sets which can serve as a great way to build a beautiful pearl collection for that special someone in your life. 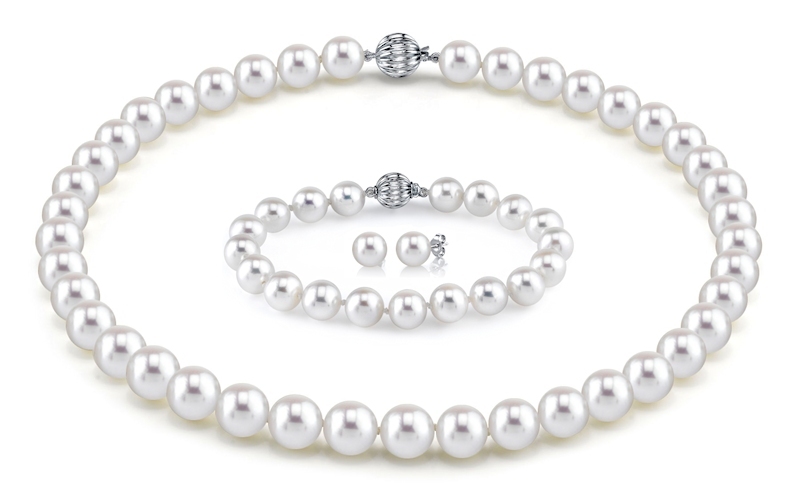 We offer pearl sets in either necklace & earrings combinations, or a full set which also includes a bracelet. One great idea we've seen customers do is purchase a pearl set then split the pieces up as you see fit so that you can slowly give each piece as a gift on multiple upcoming occasions. When purchasing a set of pearls together you can rest assured that all the pieces will match in pearl size, pearl colour, and pearl quality. We will also affix the same clasp on both necklace and bracelet. This makes for a hassle free shopping and gift buying experience. If you have any questions on our product assortment, please feel free to email us or call us at the telephone number listed in the upper right hand corner.